Sprinkle became a Chicago Bear during World War II, having gone to the same little school (Hardin-Simmons in Texas) as legendary C/LB Bulldog Turner. The smallish Sprinkle originally tried out as an offensive guard, but when George Halas returned from the war he thought Sprinkle to small and moved him to defensive end. With the move, a legend was born. Sprinkle became known as "The Claw" for his propensity to discard blockers, ballcarriers and quarterbacks with a savage arm rip. Sprinkle earned the reputation as being dirty, mean and nasty, but as he explained to me for my 2004 book Chicago Bears History, "just because I was a good, tough player doesn't mean I was dirty." 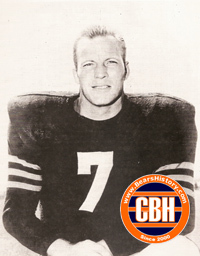 Sprinkle would play for the Bears from 1944-1955, earning one championship in 1946 and several near misses after that.